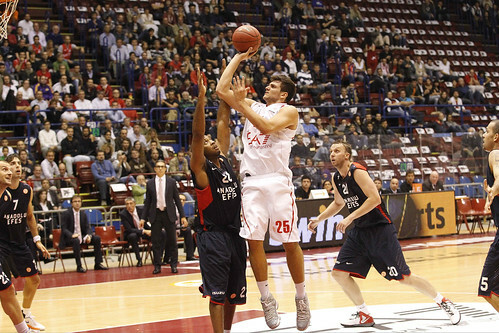 Real Madrid, Anadolu Efes, Zalgiris Kaunas, Brose Bamberg and Strasbourg are the first EA7 Emporio Armani Olimpia Milano’s opponents in the 2013/14 Euroleague. Olimpia will play again against Efes and Zalgiris and will face the last season finalist Real Madrid. Here we have coach Luca Banchi comments after the draw: “We are part of a very balanced group, including four teams that invested a lot in stability, keeping thei old coaches (we and Zalgiris are the exceptions) so they may have an advantage early in the season and we’ll need to be ready as soon as possible not to lose any ground. Real Madrid, after the London final, is a legitimate candidate to win the Euroleague; Efes, after many investments, will try to reach a significant goal. Behind Real Madrid and Efes, legitimately the favorites, anything can happen. We strongly want to reach the Top 16, our realistic Euroleague goal, by surpassing some of the teams who are in front of us in the ranking, while we fully realize how difficult the task will be”.